← Get lost, but mind the cauliflower. I have five hundred new friends but they are rather quiet. And wiggly. Well, I haven’t actually counted, but I am told there are about five hundred in a half pound of worms. They are Red Wigglers and they are small and squirmy. I bought them on the weekend. My love of worms goes back about fifteen years when I met D. She was an elder in my first congregation, a gardener, and an all-around cool person. She was very down to earth in all the best ways and had been keeping worms for years when she discovered I liked to garden. 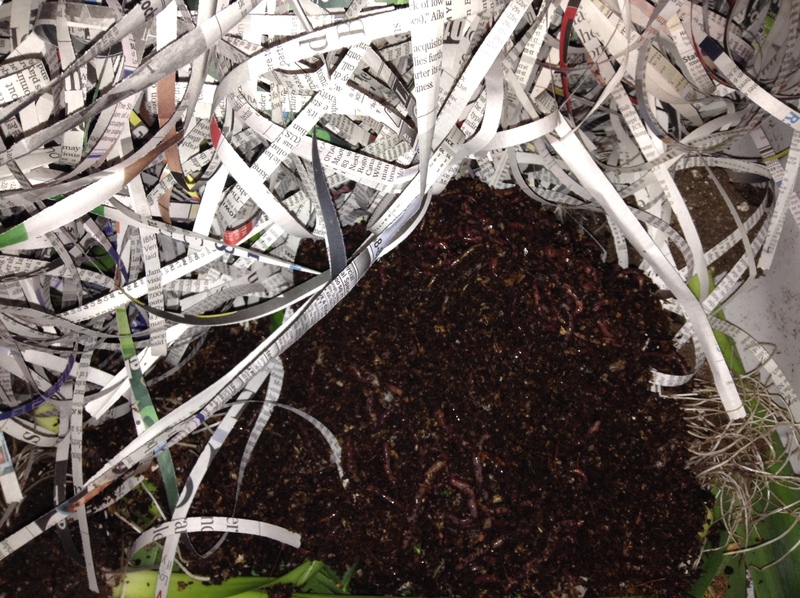 She set me up with everything I needed: a big Rubbermaid container, some shredded newspaper and, of course, worms. I loved my worms, but when we moved to Oakville we decided to leave them behind and I’ve missed them ever since. There just never seemed to be time or space for them. But this winter, it has been so cold and snowy that I haven’t even tried to toss my compost into the backyard bin. I hate wasting perfectly good food scraps, so I added worms to my Christmas list. No luck. Perhaps Santa was concerned they might get too cold in his sleigh? 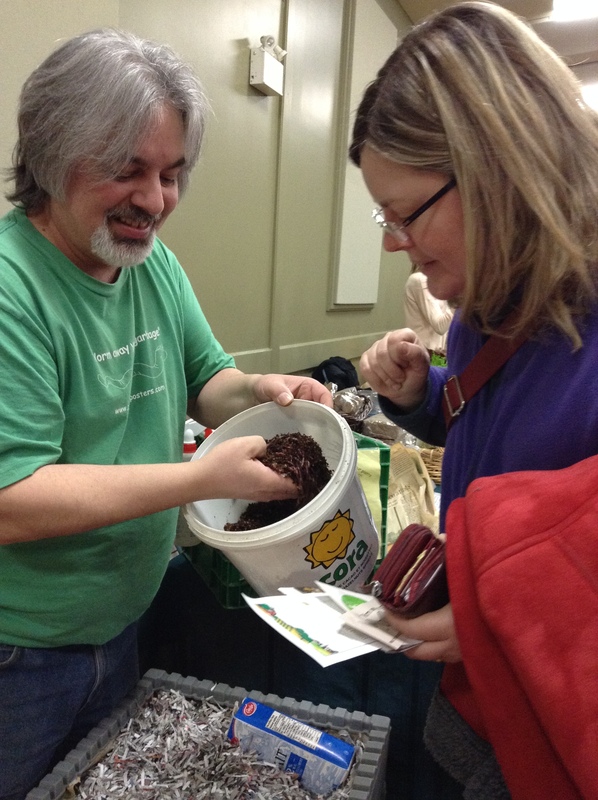 Then, as I strolled around the Halton Seedy Saturday event in Burlington, I came across Cathy’s Crawley Composters. I was so excited I almost jumped up and down–worms! For sale! Here was my chance! I scooped up my half pound of worms in their recycled milk carton and had a lovely chat with the gentleman behind the table (Cathy’s husband, I think). He gave me a five minute refresher course and made T. promise that he would name every single one. I carefully brought them home, being careful to keep them warm. The downstairs bathroom where I have installed grow lights has plenty of room for a worm bin, so I set it up in there: bin, dirt, newspaper. I needed help drilling holes in the lid, but it was no time at all before my little friends were happily moved in. I know that not everyone wants worms living in their house. My son T., however, thinks the worms are cool (he is an eleven-year-old boy, after all) and he talks to them just like I do. There is nothing creepy about them, though–the worms stay in their little bin underneath a tidy covering of newspaper and they don’t smell at all. They are perfect for Canadians–even in the winter months when an outdoor composter is dormant, food scraps can become beautiful rich earth. That rich compost will come in handy this summer as I install some new garden beds. I don’t know exactly how many T. has named already (so far there is Bob, Joe, Bill, Steve, John, Pumpernickel, Mousie, Frances, and Luigi) but I am naming at least one of them Hope. Those little critters smell like the garden and are reminding me that no matter how cold it is today, spring is coming! This entry was posted in Uncategorized and tagged backyard, food, garden, seasons. Bookmark the permalink. 3 Responses to I have five hundred new friends but they are rather quiet. And wiggly. 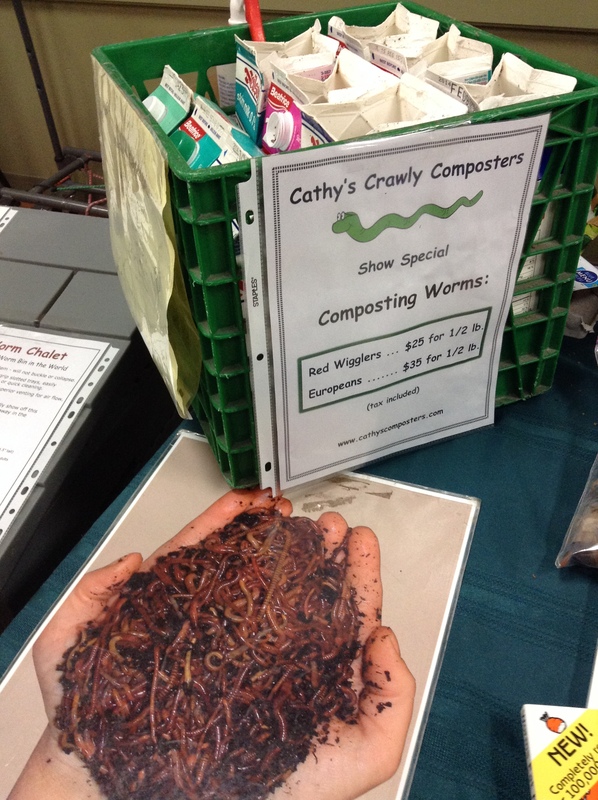 Cathy, you will be glad to know that this week in church as we celebrate Earth Day, I am showing the kids my worms!